We're celebrating Back to School with a fun giveaway from Avery. This giveaway includes great stuff like Hi-Liters, labels, GlueStics, binders, dividers, sheet protectors, Marks-a-Lot permanent markers, and t-shirt transfers. The gift basket has a retail value of over $50! Avery recently partnered with Box Tops for Education. 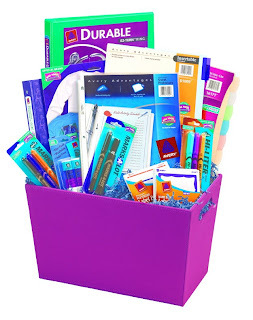 Now, when you purchase Avery school supplies for the new academic year you also receive Box Tops coupons to clip and return to your child’s school to be redeemed for cash. Each school then uses the cash at their discretion to purchase new supplies, fund programs, or buy much-needed equipment, computers, etc. 1) Leave a comment with something other than “enter me”. Tell me about the school supplies you like or give a tip about saving money or having fun with kids. 2) Tweet about this giveaway on twitter. If possible, include @thriftymommy in your tweet. Be sure to leave your twitter name or status url in the comment box. You can earn 3 tweet entries per day. 3) Follow @thriftymommy on twitter. 4) Blog about this giveaway or mention it on some sort of forum. Leave a direct url so that I can easily find the info for your entry. 5) Give this post a thumbs up on Stumble Upon, Digg It, add a link on Facebook, or some other way of promoting the giveaway. 6) Add Little Fun; Little Learning to your blogroll. You can earn entries for each of these things that you do. Please leave a separate comment for each one. It just makes it easier for tallying entries and choosing a winner. Please leave an email address on your Blogger profile or in the comments so that I can contact the winner. This contest ends Sunday, October 11, 2009 and is open to those with a US mailing address. Winners will be contacted via email and will have 72 hours to respond. Sorry for the weird colored image. I tried to upload it several times. Not sure what happened. At our house, highlighters are a must, as are page tab stickers and white-out. Of course, pretty note pads and sticky notes are fun, too! Thanks for much for the chance to win this great kit. I bought lots of school supplies right before school started thinking the kids would have a huge list. I got lots of great deals on them. Well turns out, they didn't have to bring a thing!!! We just moved to a new state. Well the supplies will come in handy for all of our crafts and also can use them for the Christmas Shoebox program at church. I am *loving* the little page-protector/dry erase marker workbook I've made for my four-year old. Totally <3 page protectors! I like school supplies that don't fall apart! School can be fun with cool things from Avery! What a great prize! with several kids, they go through supplies fast! thanks for the chance. I love getting new pens. I don't know why, but I get excited about new pens. I stock up on back to school supplies the year before when the items are drastically reduced. My favorite school supply is post it's. I love them. Two supplies that I really stock up on, are folders and spiral notebooks. Not only do the kids use lots of these for school, but I also use them for home. They really help me keep organized. Thanks. I'm an office supply junkie. Head to your office supply store about 3 weeks after school starts for great binders at a reasonable price and stock up then for replacements and the following year. Just posted about your great giveaway at My Organized Biz blog (http://www.myorganizedbiz.com/giveaway-for-office-supplies/). Hope this helps you get lots of entries. This package would be great for school supplies, but it would also be great for household use too. I would love to win. My list of "must-have" school supplies includs sticky notes and highlighters. Also, a large plain-ish calendar and multi-color markers, too. My daughter has just started college. We are paying for her school, but she is trying to make it on her own for all her other expenses by working part-time. Since we're both on tight budgets, this would be a great thing to win! I love going school-shopping. I love the feel of fresh notebook paper and the crisp smell of newly sharpened pencils! The most popular school supply at our house is the mechanical pencils. I swear my kids are hoarding them in their rooms or desks at school. I bought two packs of 50 when school started in August and I am down to about 12 of them. I like the little tote to store everything in - we desperately need one of these in our house! I am an adult student and love my highlighters and little post it flags! I love ink pens the most. I hate pencils-absolutely hate them! We buy the usual school supplies, but the fun ones seem to be highlighters, colored pens and pencils and anything else with bright colors or funky designs. My wife is a piano teacher and she LOVES office supplies. This would make her really happy and she would use it for her kids. My 4 year old is newly glue stick obsessed! I loved getting new school supplies when I was a kid...never really used them though ;) Luckily, my daughter is a great student, so she actually uses the supplies we get! Get your schools supplies when they're on sale ( I wish the teachers would give the lists befor ethe sales though). I love having fresh new notebooks, and pens. Couldn't live without post-it notes. It seems I use them for different purposes every day. I absolutely love all the cute color pens. I'm like a little kid when it comes to pens! I love the cute, funky ones! I know somewhere I've seen pens that can be attached to key rings etc. I can find the markers and highlighters with ease, but no pens! It is so much easier for me to have a pen, black marker and yellow highlighter on one rope to free up my hands. Pockets are out of the question because they either fall out or jab me when I sit and my ears do not hold writing implements at all. My new favorite school supply is Zebra Caboodles Pencils. They work so well for standardized test bubbling! I added this post on stumbleupon. The school supplies I like are pens, spiraled lined paper and craft supplies! Today I have my nieces over, and for fun, I bought shoestring licorice and fruitloops. We're making "jewelry" out of the ingredients. Cheap, fun, and the girls are having a blast. Thanks for the giveaway. My kids love post-it notes. They use them for everything from bookmarks to notes. I like all school supplies, pencil boxes, folders, highlighters, especially sharpies! I love getting pens because mine always seem to disappear. I got a bunch of great deals on school supplies from walmart. They had so many things marked down just before school started. This would be helpful. Thanks for the chance. Who couldn;t use more school/office supplies? I am an addict and love having a healthy supply in the house. I absolutely love sticky notes. I would be totally lost without them. We buy school supplies in bulk for the year when they are on sale. We also buy several cases of various supplies to donate to certain charities that help low income and families that have lost their jobs over the last year. If you buy supplies with coupons and wait till they are on sale you will save extra! I always buy school supplies early at Wal-Mart (like as soon as they are on the shelf). If anything isn't on the school supply list I donate it to the school because they prices are so cheap. I buy supplies all through the year, so it's not such a blow to wallet come school time! Our favorite item is a pen that has pen ink on sone side and a highlighter on the other. It has a cord on it, fits nicely around your neck. It comes in handy for the kids! My favorite school supply has got to be crayons. Nothing like a brand new box of them. My favorite school supplies include everything Crayola. They make good stuff. I love school supplies. When I was growing up I spent my allowance and babysitting money on pens, pencils, paper, crayons, etc. I have a bookkeeping business and I hit all the back to school sales and stock up for the year. We stock up on school supplies at target and staples late in the summer when they have great sales. I love the new midget sharpies. I also prefer to purchase items made from recycled paper. I like highlighters and felt tip art pens. Like most here, I also buy school supplies when they are on sale and stock them away until needed. I like highlighters cause you can use them for anything. I always loved going school shopping! Picking out what notebooks/folders/binders were going to represent YOU this whole year. I have a thing for pens. My philosophy is you can never have too many. Thanks for the giveaway. My tip for saving money is to buy school supplies when they go on clearance. I love Avery, I remember using their products ever since I was doing projects in middle school- they've never let me down! This selection of goodies look really useful, you can never have too many pens or binders! I'm obsessed with school supplies - I love markers, highlighters, pencils, pens, folders, notebooks, binders, stickies, post-its - I have entirely too much! I'm a huge fan of sticky notes. We save money on school supplies by waiting for them to go on clearance (Target has great deals). Christina - xristya@rock.com - When I was little I ALWAYS liked going back to school, and the school supplies were a symbol: the beautiful way the pencils smelled, and the notebooks that had not one single word in them yet! I home school my daughter so I wait until they mark down back too school items. I got 50 notebooks for 5 bucks at walmart. My son that is 3 so wants to go to school but he cant yet, so i try and do lots of learning stuff with him at home. We go through a lot of office supplies! I like sharpies, hubby *loves* index cards - he does all sorts with them! At our house we use a lot of highlighters and whiteout. My daughter needs a good quality binder that will hold up to everyday abuse. Thanks for the giveaway! I like school/office supplies that are functional but still fun or have a cool design to them. With 3 teens things can get expensive--when buying back to school supplies so I poor over the circulars in the newspaper--I have great luck wit Target, Office Depot, Office Max, and Walgreens. Office Depot has great deals- but you have to be there the minute it starts --they go fast. I love office supplies, and I stock up both during and after the back to school rush, when nearly everything's on sale. The school supplies I like the best are loose leaf notebooks. You can always use notebooks for a variety of topics. You can save money by getting meat/s at the grocery store on certain days that they havent sold the meat and are reducing it for quick sale so be on the look out for that. Our walmart does this also so check yours out. Great prizes! I had so much fun shopping for school stuff with my daughter this year! It's her first year of school, and we made a day of it! MY son is 5,he loves glue sticks&crayons! I start shopping for school supplies as soon as they go on clearance when school starts so I have the basics already bought for next year. we go through a lot of sticky notes. there's one stuck on everything with a reminder. I usually try to buy my supplies in July when the selection is better. The basics, I wait for sales. I buy extra and then use then as Christmas gifts when the supplies are running out at school. We buy school supplies when I see sales and stock up. They during the year we have notebooks or pencils if the kids need them. We do most of our school supply shopping in the week after all of our local schools start back up. That way everything is getting clearanced and then we get great deals and we just save it all until the following school year. Saves us money every year. My kids love getting new school supplies its fun to share what they have gotten with their friends. I love Avery products because they always work! I like new crayons and markers at the start of the school year. All sharp, all the colors are fresh, and they smell good! Now that my daughter is in middle school she has to have lots of post it notes and bunches of binders! A member of our family who was supposed to start college two years ago but was not able to because she was diagnosed with Leukemia was finally able to start this past month. I would really love to win this for her so that she can have these items for her school work. Avery makes the best office supplies, especially their labels. I need some nice pens and a good 3 ring binder. I put your link on my blog roll. I try to save money by combining coupons with sales when grocery shopping. I like to buy all of my school supplies for the year during Back to School sales to save $. Buy school supplies on the off-season! I saw backpacks yesterday for $5!